'Say that again?' - Ghost Huddle Killah goes on the record. So it went with Gus Malzahn. During our 17 minute phone interview I was unable to breach the invisible barrier between random college kid writing for the campus newspaper and intense and private coach who drinks eight cups of coffee a day and listens to Top 40 Christian music. Things stayed impersonal, no matter how many “Do you listen to the Wu-Tang Clan?” and “What is your power animal?” type questions I asked. Not to say Gus (first name basis) was unhelpful. Far from it. He answered every question I asked and would’ve probably talked to me for another 15-20 minutes. But I ran out of questions and my mind froze. It’s like talking to a beautiful woman — as soon as you walk away, every clever, witty, and funny thought you’ve ever had comes rushing forth. But I could have asked deeper and more probing questions and gotten a better feel for who Gus Malzahn is as a person, father, coach, man. Maybe there will be a next time. Here’s the stuff that didn’t make it into The Plainsman article. Could your offense work in the NFL? Are you pleased with this recruiting class? Sideline coaching vs. coaching from the pressbox? Do you listen to much rap music? 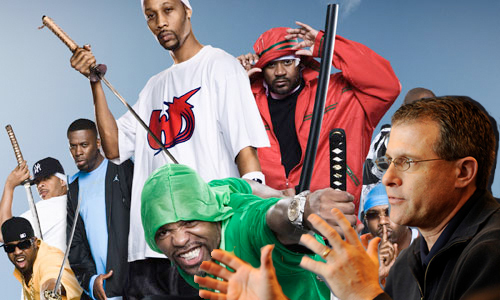 Do you know who the Wu-Tang Clan is? Maybe something fast? Like a cheetah? What offensive statistic do you measure success by? Is that something you stressed last year? Were you pleased with the way Chris Todd played? Did you teach him the pump-fake? Were you surprised by the play of Darvin Adams and Terrell Zachery? What’s your favorite play to call? Do you have a good relationship with Huston Nutt? What’s your role in recruiting? Do you promise to stay at least two more seasons? Ben writes The Win Column, among other things. He is a student at Auburn University. Most of his time is spent doing as little as possible, eating and controlling manageable vices. He will one day graduate with a degree in journalism and maybe find a job. Fingers crossed. Write to him at [email protected]. Even for a college kid, this is clearly one of the most unprofessional interviews I have ever seen. One of the most intriguing coaches in the college game gives you his time, and this is what you did with it?? Your bio says you “hope” to graduate with a degree in journalism. If this interview is indicative of your progress, you should seriously consider changing majors before it’s too late. Should you be fortunate enough to actually earn a living as a writer, you should keep a copy of this interview as a reminder of how to not waste opportunities when they come your way. Disagree…seems to be a pretty good interview. The only way to get anything new from Malzahn that hasn’t been repeated in the media constantly is to ask him quirky questions like some of the ones above…if anything I would’ve liked to see more of the quirky questions, maybe some where Malzahn is more likely to know the context. Chill. If you had some specific probing question, perhaps you should have submitted it when asked. If you’d like to provide some genuine constructive criticism, Ben’s email is just a few clicks away and I’m sure he’d welcome the input. However, if you’d just like to complain, please go do it somewhere else. Not sure where you were going with the Wu-Tang Clan questions (who doesn’t like a little Poppa Wu?) but I love the Power Animal question. Didn’t work out this time but you never know what insight you might gain unless you ask the question. Thanks for sharing the stuff that didn’t make the cut. It’s tough to interview a coach like Malzhahn, when you’re not asking the same questions every other journalist has asked him over the last few years, and still make it interesting. Obviously, that’s what they tried here, with mixed results. It sounds like Malzahn isn’t the type of guy who thinks about power animals and hip hop. Most of the other questions were pretty good, though. The NFL question, and the favorite play question, for example. BW, something tells me you’re not a journalist. Am I right? THAT is my favorite photo illustration on the site so far this year. Wu! Tang! Wu! Tang! whoa BW take a Midol. besides, this is what didn’t make the actual article, these are the deleted scenes. Good interview. A nice attempt to explore the human side of the guy. I’d have liked to see this stuff in The Plainsman instead of what was there. Gus has always struck me as an ODB fan. Yeah, I realize that’s the stuff that didn’t make it into the article–I can read. My point is, you have the author of the article explicitly stating that he “would’ve probably talked to me for another 15-20 minutes”. Therein lies two issues. First, you waste the time you did get asking questions that, even if he tried to answer, add nothing to the article. Is anyone really walking around campus pondering Gus’ thoughts on power animals or Star Wars? Really? And second, you have a “mindfreeze” that suggests not being fully prepared for the occasion when you do get more time. But I’ll digress as I admit that a student writer should have some latitude and writing for the Plainsman should be an educational medium where those who hope to make a career journalism can explore their style and find what works for them. On that level, I’ll give some slack. But at the same time, criticism teaches us as much as credit. If you want to write professionally, ya better be ready for both. Yes, BW. I understand what you are saying. If you read closely in the opening couple of paragraphs, you will (would/ should) realize I wanted to ask Malzahn all kinds of interesting questions. In fact, I was coming up with questions when he called me at 3:30 on a Thursday afternoon. I ran out of time/ ideas. As I said, I’m not the most experienced interviewer. No excuses, but it happened. I tried to make it clear with that opener. The fluff questions were for a 10 question Q&A. That was literally my job — ask Gus Malzahn 10+ random questions for an info box. Those questions can only (I think) be found in the paper copy. Those are some of the things I wanted to know about Gus. Maybe that’s not what you wanted to know. That’s fine. I was trying to not ask him the same stale and tired questions he gets asked by every beat writer. Maybe I failed. Oh well. Next time. Man, I read your first three paragraphs and was starting to have a change of heart. Then I read the last sentence…and now I’m wondering if the Plainsman is getting ready to give us another Selena Roberts. Yeah, that was a bit harsh. But the sentiment remains. I can’t write with anything approaching ummph if I’m worried what some dude (lady?) named BW is going to think. I do (actually) appreciate the criticism. In the future I will try to be more prepared and thorough. What exactly is “ummph” and why do I never hear Rick Reilly, Bob Ryan, Jason Whitlock, etc. refer to their goal of achieving “ummph”?? Personally, I think “ummph” is what people strive for when they know they don’t have the capacity to perform in the upper levels of their chosen industry. “Hey, if I can’t be one of the best, I need to find a way to pander to some small audience so I can get a few crumbs for myself”. Back off, dude. If you read this site regularly, you’d know Ben has a refreshing writing and interviewing style. He’s good, as good as just about any student writer you’ll read. What are you strivng for by bashing a talented kid who’s writing for free? I actually liked the stuff not published better than the actual article. I would not have asked about animals, but Coach Gus’s response made me laugh. Also, there was really good insight to the Chris Todd and Cam Newton questions, plus some confirmation to my theory that Chizik asked for assurances Malzahn would stay a certain length of time. That appears “to be the plan.” I would say there was a good nugget there other reporters might have missed! I’m glad they don’t. I have no desire to write like any of those people. I’d as soon have a bright light shined in my eyes as read or listen to Rick Reilly. We’re putting up Jason Whitlock as a beacon of professionalism in journalism? YES! Let’s have more journalists like HIM. Yeah, I specifically included Whitlock on that list for a reason. Whitlock may be controversial at times, but when he ventures off the beaten path, he knows the difference between what is interesting and what is adolescent silly. CD, you can knock Reilly all you want, but deep down you’d be happy to have a fraction of his journalistic talent. I’m starting to think BW tried to get a gig at The Plainsman but was turned down. It’s uncanny, BW, that you know my innermost desires even though you’ve never met me. Anyway, Reilly is extremely successful, no doubt, but I’m not a big fan. Nick Saban, Celine Deon and Dane Cook are highly successful. I don’t like them, either. Ben’s piece on David Housel made the most recent issue of Auburn Magazine. Apparently some Auburn alumnus appreciates writing that is nothing like Rick Reilly, Bob Ryan, or the incredibly mature and always on point Jason Whitlock. @ BW: In the future, please write and submit your own stinking articles to the Plainsman for critical review. I thought the article was fairly clever, in spite of your ranting. But good luck in your journalistic career, if you have one.